Renowned for its gastronomic specialties and the beauty of its natural sites, the Lot region is also home to innumerable jewels of human genius. We propose to introduce you to waterway tourism in this magical setting. Your cruise will be all the more successful for it! From Cahors Many people describe the Lot as the most beautiful river in France. Once you embark upon your licence-free rental boat, you’ll come to understand why, as you take in its series of green, hilly landscapes. From Luzech Set in a landscape of valleys and plateaus, Luzech is a pleasant traditional town in this historic Quercy. 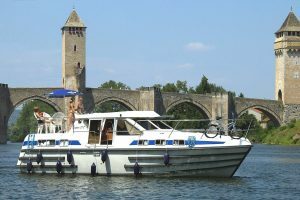 At the heart of the Cahors vineyards, it’s home to our waterway base, from which we invite you to embark on a cruise down one of France’s most beautiful rivers: the Lot. Choose to nav­i­gate the waters of the Lot and you’ll be offer­ing your­self the oppor­tu­ni­ty to put togeth­er a bespoke cruise tai­lored to your pref­er­ences. Would you like to leave from the his­toric town of Cahors, the region’s wine­grow­ing hub, and dream up a gas­tro­nom­ic cruise ? Or would you pre­fer the charm of the town of Luzech, a ver­i­ta­ble penin­su­la sand­wiched between the mean­ders of the Lot ? Whichev­er route you choose, we’ll train you in han­dling your rental boat to ensure you can nav­i­gate with con­fi­dence. What­ev­er your itin­er­ary, you’ll enjoy the plea­sures of water­way cruis­ing, mak­ing the most of the calm, idyl­lic set­ting. 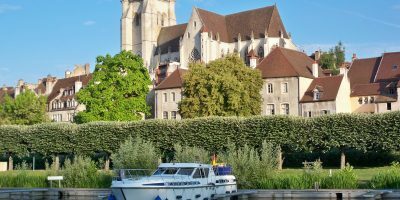 Wher­ev­er your cho­sen des­ti­na­tion, the Lot remains one of the most beau­ti­ful rivers in France, with mul­ti­ple ideas for stop-offs. Enjoy breath-tak­ing views, set off for a cycle ride or opt, instead, to take a dip in one of the region’s lakes. It’s high time, then, to embark on your cho­sen house­boat and set off to embrace relax­ation and dis­cov­ery ! Turn this water­way cruise into a real gas­tro­nom­ic jour­ney. The region’s culi­nary spe­cial­ties, from duck con­fit to tra­di­tion­al foie gras, are unveiled in the local mar­kets. Moor up and leave your licence-free boat to bring back the region’s gas­tro­nom­ic trea­sures to enjoy on board. The vine­yards of Cahors are rep­re­sen­ta­tive of the land­scapes that will accom­pa­ny you dur­ing your water­way cruise. You can also enjoy strolling the streets of Cahors. From the amphithe­atre to Saint Eti­enne cathe­dral, the town’s build­ings tell you an excit­ing and event­ful sto­ry. 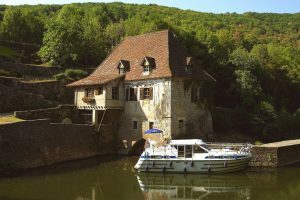 Nav­i­gate between the cliffs to enjoy an excep­tion­al spec­ta­cle and moor up on the approach to one of the most beau­ti­ful vil­lages in France, Saint Cirq Lapopie. 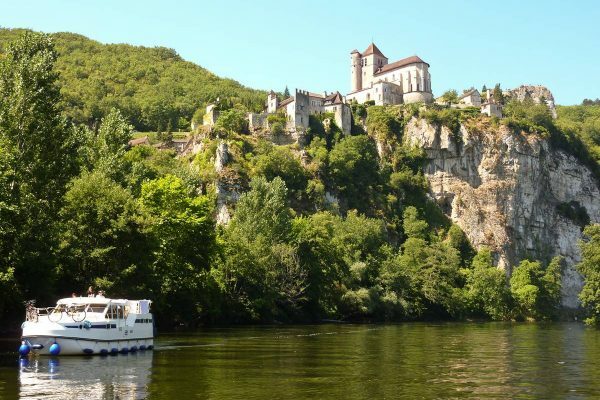 Don’t miss the bastide of Castel­franc near Cahors and, if your cruise takes you close to Luzech, a walk to the foot of the ele­gant Saint Pierre church is a must. the essentials for a successful trip! 1 / 3 Lot and its gastronomy From market stalls to Michelin-starred restaurant menus, you’ll be able to savour black truffles, Rocamadour cheese accompanied by a glass of Cahors wine, Quercy melon, saffron and Quercy farm lamb. 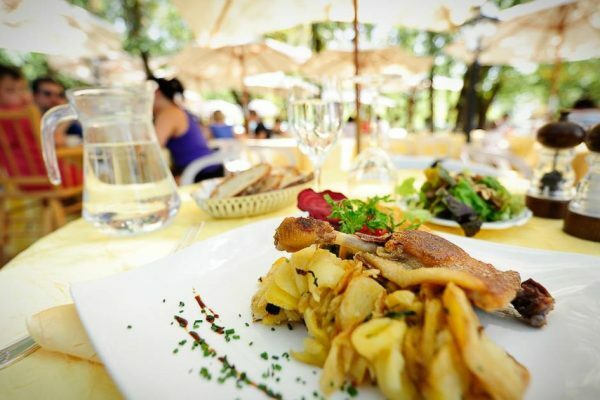 Lot is a foodies’ paradise and you’ll learn that eating is like a religion in Cahors and the surrounding region. The gastronomy of the Lot Valley is a real treat, with the art of the table developed by people who love their land. 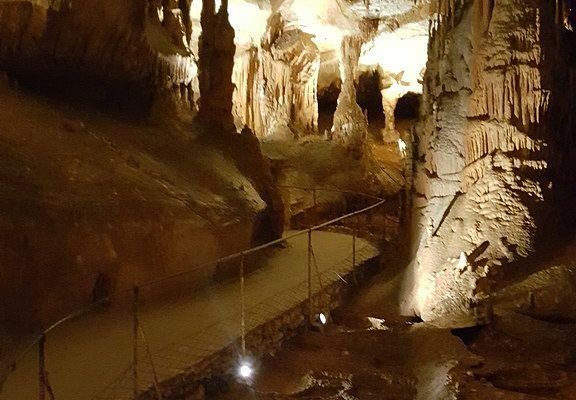 2 / 3 Pech Merle Cave Pech Merle cave is an ornate prehistoric cave located in the Lot département (Occitanie region of France), in the town of Cabrerets. 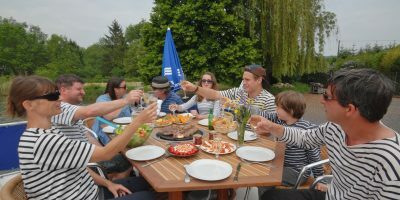 It opens onto a hill overlooking the valleys of Sagne and Célé in Quercy. It’s quite vast, extending for almost two kilometres, but only 1,200 m of galleries and rooms are currently accessible to visitors. The cave has two floors of galleries adjoined by shafts and sloping tunnels, located around 100 metres above the rivers. 3 / 3 Saint Cirq Lapopie The medieval town of Saint-Cirq Lapopie, with its 13 historic monuments, is one of the most beautiful villages in France. Perched on a cliff 100 metres above the river Lot, Saint-Cirq Lapopie is one of the most important sites in the Lot Valley. Below the fortress, the streets of the village, enclosed by fortified gates, are still home to several old houses with stone or half-timbered facades built between the 13th and 16th centuries. Want to discover another destination?